Hello, and welcome to Big School, your essential guide to the secondary school options available for your children. 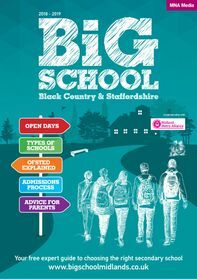 It is packed full of advice and useful information for parents and children when it comes to making one of the most important decisions in their young lives – which secondary school you would prefer your child to go to. Moving up to Year 7 and going to “big school” for the first time is a huge moment for both children and their parents. For many young people, secondary school is a step towards independence, growing up and leaving childhood behind, so it can be overwhelming for children and parents alike. They will of course spend a large proportion of the following five years at school, and that’s why choosing your preferred place of learning is so important, and why you should involve your child in this life-enhancing decision. They may be keen to continue their education with current primary school friends which could influence their choice of secondary school. But you should also consider your child’s strengths and interests – many secondary schools specialise in particular areas of the curriculum and this could help shape your thinking. It’s also important that your child’s character and the character of the schools you are considering match, and that you find out about the extra-curricular opportunities outside lessons which are on offer – because being involved in after school clubs can make a huge difference to the enjoyment of secondary school as well as having benefits for learning. We are fortunate to have so many high performing secondary schools across the region – now is the time for you to choose which one is right for your family. We wish you and your child the very best for their continuing education. Our E-Magazine is bursting with a range of secondary schools available to you. It’s inevitable that not everyone will get their first choice of secondary school. And while you will be keeping your fingers crossed that your child gets a spot, you should be prepared in case your wish doesn’t come true. Popular schools will be oversubscribed meaning some applicants will miss out so it’s important to remain realistic when waiting to hear if you’ve been successful. Also, it’s vital to spend some time preparing yourself in case you want to appeal a council’s decision. It may well be that you are happy to accept a place at a school further down on your list if you believe it is still a good option for your child. But if you feel the decision made is not reasonable or the procedure has not been followed correctly then you are within your rights to appeal. Your case will be heard by an independent appeals panel and the system allows you to argue that there are extra reasons why your child deserves a place at your top choice. Parents are advised to accept the place you have been allocated regardless of whether you want it – this is a safety net to ensure you have a place for September if the appeal is unsuccessful. It can always be rejected at a later date if a space becomes available, or if the appeal is upheld. Then you should contact your preferred school to be put on a waiting list should the school have one. This may happen automatically but it is always worth checking that it has been done. This could remove the need for an appeal hearing if a place is freed up by other means, such as a change in circumstances for another pupil. Parents should lodge their intention to appeal with either the local authority or, if it’s a free school or academy, the governing body. Details of who to contact, instructions for beginning the appeal process and the deadline will be normally be provided with the place offer letter sent to you by the council. If more than one school declines to admit your child, you are allowed to make separate appeals. If you think there are good reasons why your child should go to your preferred school then you can present your case to an independent appeal panel. You should provide a list of reasons why your child needs to go to that school. Focus on positive reasons why your child needs to attend that school as opposed to the allocated one. Don’t just state why your child should not go to the allocated school. This might include the pupil’s specific talents if the chosen school has specialist science or language facilities. It is recommended that parents take along evidence such as school reports to back up your argument. Either the school or council will give you at least 10 school days’ notice of the hearing. The panel is usually made up of three to five members of the public – both with and without experience of the education system. Local authorities recommend that you provide evidence of why your child should attend your first choice and why it would be bad for them to go to another school. The school will also present its case for why it cannot take extra children and why it would be bad for the school if they had to. You will be able to pose questions to their representatives so think about what you may want to ask in advance. Members will listen to both cases and ask questions. During the hearing, the panel will also check that the school’s admission arrangements comply with the Schools Admissions Code. If the admissions criteria are legal and were properly followed, the panel must decide if they were followed fairly and thoroughly. The result is sent by post within seven days and the decision is legally binding – it can only be overturned by a court. If successful, your child will be allocated a place at their preferred school regardless of the class size. If the appeal is unsuccessful you can still put your child’s name on the waiting list in the hope of a place becoming available. There is plenty of time for circumstances to change by September as families may move out of the area meaning spaces can free up. But understand that you can move both up and down a waiting list. If a family was to move into the area and be closer to the school, they could go above you. If you’re unhappy about the way the appeal process was carried out, you can complain to your Local Government Ombudsman. They can recommend a new appeal, but they can’t review or overturn the appeal panel’s decision. It’s obviously easier said than done but it’s worth remembering to keep an open mind throughout the application process. If it doesn’t all go to plan then you will need to remain positive about the school your child has been allocated because that will make it easier for them. Children pick up on your mood and if they know you’re unhappy with their school it could affect how they settle in. Concentrate on all of its positive attributes. If you are still feeling uncertain contact the school to arrange a visit and speak to staff to allay any fears. Touring the site for the first time or second if you attended an open day may help you see it in a new light. Also remember that your opinions and priorities may well change and the reasons why you ruled the school out may not matter so much in the future. You may be worried about how you are going to manage with your child attending a school further away but then find it easier than you were expecting. Maybe you are concerned about previous performance figures but then see test and exam results start to improve. It’s also very likely that after your son or daughter starts you come to realise it was the best fit for them after all.